What a great time of year! And if you wish you could bottle up some of this wonderful Season... find out how at the August 2nd Evansville Farmers Market! 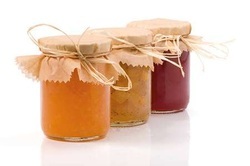 "Canning Tomatoes and Making Salsa;" "Making Jams, Jellies, and Pickles;"
And-if you think you just might be in the market some day-there will also be information on selling your goods under the Wisconsin Pickle Bill--as well as info area incubator kitchens. Julie Gibes, Nutrition Educator with the Univ. WI Extension-Rock County--and also a Certified Master Canner- will be our presenter, and we at the Evansville Farmers Market are most excited to have her! This program will take place inside (air-conditioned!) Creekside Place, 102 Maple St. (right by our Evansville Farmers Market), with topics presented from 9am-noon. (Come for one or all!) For more details/to register, please call Marie Messinger (882-9032) or e-mail her at: sweetfieldfarm@hotmail.com. And, lastly, please pass this message on to anyone you know who might be interested! Thank you! We're looking for individuals/s who might be willing to help with the EFM Kids Arts & Crafts Table this summer! Our goal is to give kids some great memories this Summer of coming to the Evansville Farmers Market! Be a part of it!" Let Marie know (882-9032 or sweetfieldfarm.com) if you're interested in volunteering, and thanks for considering this! 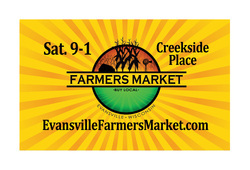 The 2014 Evansville Farmers Market opened on May 3-and we would love to see you! The EFM will be running every Saturday, 9am-1pm, in front of Creekside Place (102 Maple St., Evansville,) through Oct 11th. Visit the EFM Facebook Page here. Email for more information here.